We Lie to Ourselves | One Person at a Time | Dynamic Catholic. week 8: Are You Sleepwalking? Are you awake? Are you awake, or are you sleepwalking? I think sometimes we just sort of stumble through life, really unconsciously. I think sometimes we just sleepwalk. Now, one of the things God's saying to us is, “Wake up.” One of the things God’s saying to us is, “Stop sleepwalking through life.” You see, God doesn't want us to be sleepwalking through life. God doesn't want us to sleep. He wants us to wake up. He wants us to live life very consciously. If you borrow your spouse's car, when you take it back, do you take it back with the gas tank empty, or do you take it back with the gas tank full? It’s a little thing, right? But that tells me if we're awake, it tells me if we’re asleep, it tells me if we’re aware, it tells me if we're conscious, it tells us tells me if we're unconscious. You see, God wants us to live a life of incredible awareness. When you walk into the room, any room, he wants you to notice who's the person in the room who's suffering the most. He wants you to notice that person so you can go over, you can love on that person, you can encourage that person, you can help that person come out of their their pain, their suffering, so that they leave that room in a different state than what they came into. Christians, you and me, we're called to change the world. One moment at a time, one day at a time, one situation at a time. But we've got to stop sleepwalking. We’ve got to wake up. We’ve got to wake up. And in order to wake up, we absolutely have to know what the biggest lie in the history of Christianity is, we have to kick the biggest lie in the history of Christianity out of our lives, and we have to help other people to do the same thing. God wants us to live life consciously. He wants us to notice people around us who are suffering and need encouragement. He is calling us to change the world one moment at a time, but we have to stop sleepwalking through life in order to do that. For a deeper look into living a life of incredible awareness, get your copy of The Biggest Lie in the History of Christianity. Join Matthew next week as he discusses another key theme from the book. facebookIcon@1x Created with Sketch. twitterIcon@1x Created with Sketch. pinterestIcon@1x Created with Sketch. Like the quote? You'll love the book. Get your copy today or find out how you can share it with your parish. Want to learn more about the book? 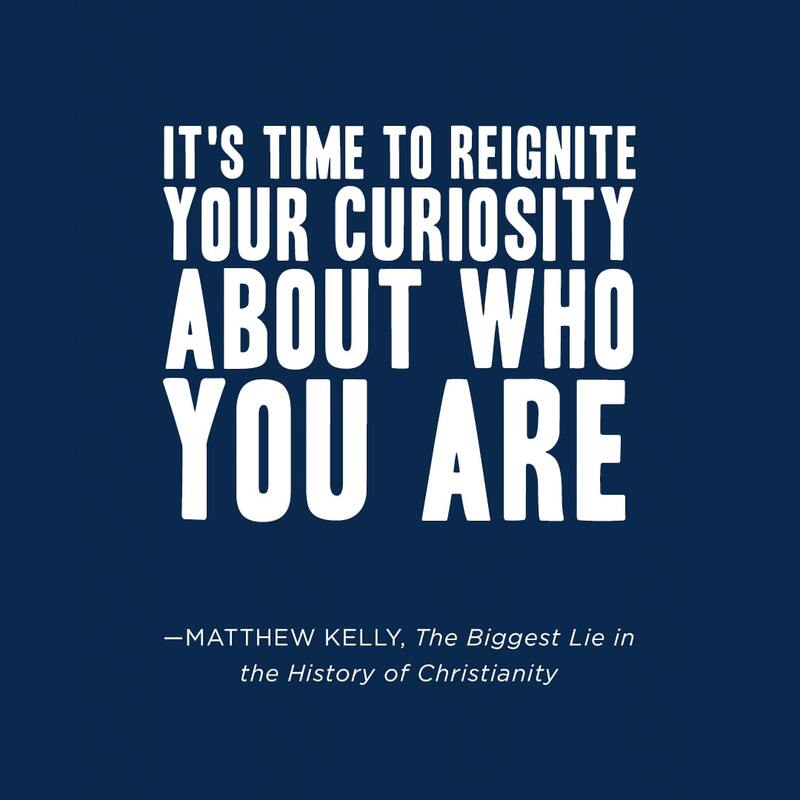 Sign up to for Matthew Kelly's Overcoming the Lie video series. Every Monday until December 3, you'll receive an email with a video of Matthew sharing key themes from the book–and practical ways to apply the themes to your life.